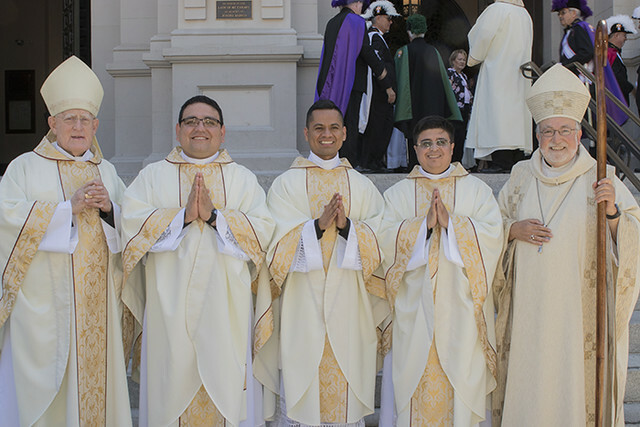 On June 2, Bishop Jaime Soto ordained Fathers Jesus Hernandez, Rene Jauregui and German Ramos to the priesthood during a Mass in the Cathedral of the Blessed Sacrament in Sacramento. Concelebrating the Mass was Bishop Emeritus William K. Weigand. Deacon Hernandez is a native of Irapuato, Guanajuato, Mexico. He studied for the priesthood at Seminario Hispano de Santa Maria de Guadalupe in Mexico and at St. Patrick's Seminary and University in Menlo Park, CA. He spent his pastoral year at St. Peter Parish in Dixon. Deacon Juaregui is a native of Mexticacan, Jalisco, Mexico. He studied for the priesthood at Seminario Hispano de Santa Maria de Guadalupe in Mexico and at St. Patrick's Seminary and University in Menlo Park, CA. He spent his pastoral year at St. Joseph Parish in Redding. Deacon Ramos is a native of Tomatlan, Jalisco, Mexico. He studied for the priesthood at Seminario Hispano de Santa Maria de Guadalupe in Mexico and at Mount Angel Seminary in St. Benedict, OR. He spent his pastoral year at Our Lady of the Assumption Parish in Carmichael. During the ritual, the three new priests lay prostrate before the altar of the cathedral. Among the rites: Each new priest received his vestments and was assisted by those who have been important to them on their journey; and each of the priests of the diocese who were present blessed the new priests. Well-wishers gathered on the steps of the cathedral following the Mass and in the lower level of the cathedral afterward to line up to receive blessings from the new priests. In remarks at the conclusion of the Mass, Bishop Soto said the new priests "have come as pilgrims following the Good Shepherd on a journey of faith over many years. In his tender mercy and unfathomable wisdom, he has brought you to the verdant and vibrant valley of Sacramento. From among the many of your immigrant brothers and sisters, he has chosen you with a brother's affection to share in the shepherd's watch over this numerous, restless flock. Your brother priests and I rejoice that the Good Shepherd has favored us with your company and renewed our zeal with new companions."